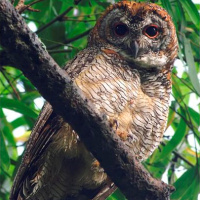 The Mottled Wood Owl is a medium-sized yellowish-red owl with a rounded head and no ear-tufts. Duet 1 - Melghat Tiger Reserve, Maharashtra, India. January 2013. CC Frank Lambert. Duet 2 - Chelamattom, Ernakulam, India. May 2010. CC Dilip KG. Description: The facial disc is whitish, and finely barred concentrically with blackish-brown. Eyes are dark brown and eyelids are dusky pink or dull coral-red. The bill is horn-black with a paler tip. The nape is white and black, mixed with a chocolate colour. 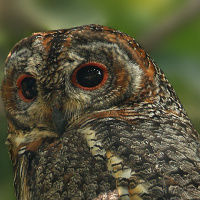 Upperparts are mottled and vermiculated with reddish-brown, black, white and buff. There is prominent black spotting on the nuchal area. The throat is chestnut and black, stippled with white. The rest of the underparts are white with golden-buff to orange-buff and with narrow blackish bars. The toes are brownish-flesh or dirty yellowish-brown with yellow soles. Claws are horn-black. Size: Length 41-48cm. Wing length 320-372mm. Tail length 174-215mm. Weight data unavailable. Females are likely larger than males. 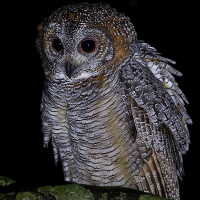 Habits: The Mottled Wood Owl is a generally nocturnal bird. 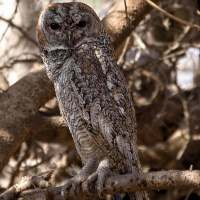 Roosts during the day on a branch hidden among foliage, in pairs or sometimes family groups. Voice: In breeding season, the male utters a loud, shivering, hollow, 'laughing' call - "Chuhuawaarrrr", which is the territorial song. 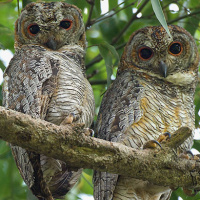 Both sexes also give a single, metallic hoot, as well as multiple conversational hoots. Occasionally gives a harsh screech similar to a Barn Owl. Hunting & Food: Feeds on rats, mice and other rodents, as well as birds up to the size of a domestic pigeon. Also takes lizards, crabs, beetles and large insects. 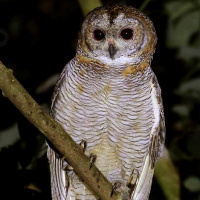 Breeding: The breeding biology of the Mottled Wood Owl is little known. Breeding season is generally February to April. Nests are in natural hollows. Normally 2, sometimes 3, creamy-white eggs are laid, averaging 51.1 x 42.6mm. Habitat: Lightly wooded plains, open woodland and groves of mature trees on outskirts of villages and cultivated land. 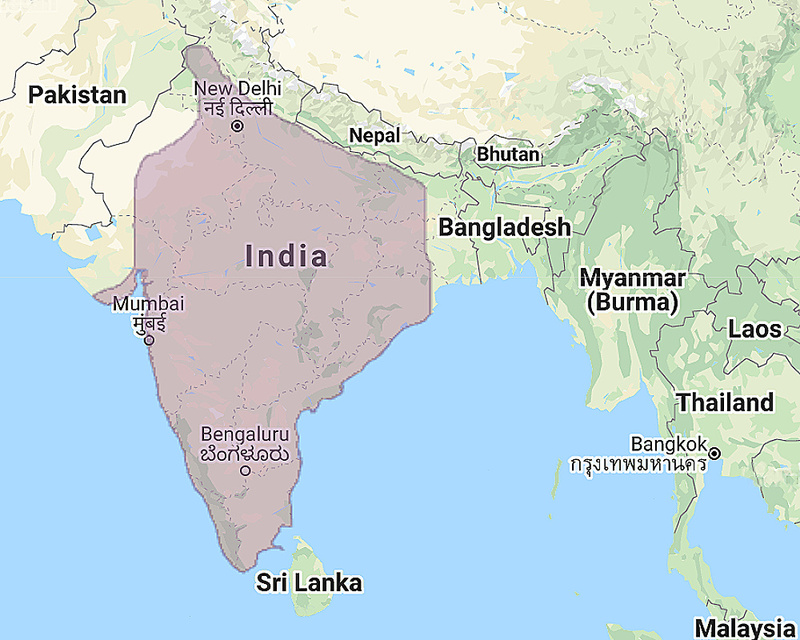 Distribution: India, from the Himalayas eastward to lower Bengal an south to southern Nilgiris and Pondicherry. Formerly in northeastern Pakistan, but has not been seen there since the early 20th centrury. There have also been sightings in western Burma. Status: Common and widely distributed. Original Description: Lesson, Rene Primevere. 1839. Rev.Zool. Revue Zoologique, par la Societe Cuvierienne (Rev. Zool. ; Journal mensuel publie sous la direction de M. F. E. Guerin-Meneville) 2: p. 289. Baker, Stuart. 1927. "The Fauna Of British India including Ceylon and Burma 2nd Ed. Vol IV". Taylor and Francis. Grimmett, Richard; Inskipp, Carol & Inskipp, Tim. 1999. "Birds of India, Pakistan, Nepal, Bangladesh, Bhutan, Sri Lanka and the Maldives". Princeton University Press. Page by Deane Lewis. Last updated 2015-10-29.